I always coordinate my deserts accordingly. Word of the day: Mexican. Hmmm… flan? Naah. What to do? I had a couple of pounds of cream cheese in my fridge screaming “use me!” Sixteen ounces of cream cheese is not nearly enough for J-Wiz’s grandmas cheesecake recipe, that I was so lucky to get my hands on. That calls for a whopping 5 lbs of cream cheese. Yes, I know… 5 lbs. So I did a little research and found a couple of recipes that inspired me to make these Mexican Cheesecake Bars. If you didn’t already know, I am not a baker. I will pop a can of dough so fast… well, I mean…I won’t pop it. I can’t pop it. J-Wiz will pop it for me as I cower in thew other room, covering my ears. Soapapillas are sweet little pockets of fried pastry dough, sometimes filled, served with honey. Of course, these Mexican Cheesecake Bars are more of an improvision of the authentic Soapapilla, but are delicious none the less. They’re easy to make and are A-M-A-Z-I-N-G! So amazing, that I made a pan last night and they disappeared in 30 minutes. Then I turned right around and made another pan tonight. And they were gone just as fast. They’re easy to make and work well for dinner desserts or breakfasts and brunches. I hope you brought your sweet tooth! In a mixing bowl, cream together the cream cheese and 1 cup of sugar until light and fluffy. Add the vanilla and the two eggs, one at a time. DO NOT OVER MIX. Anybody who is anybody, knows that over beaten cream cheese will become thin, almost liquidy. Oh? You didn’t know that? Well, you know now! Set aside. Pop the first can of crescent rolls and roll them out flat. Use a little flour so it won’t stick! Come on now, even I know to put flour down when rolling out dough…even if it DID come ready-made in a can. If you don’t have a rolling-pin (or don’t feel like doing all that), it’s pretty easy to just lay down the dough and work it in the bottom of the pan with your fingers. Spread the cream cheese mixture, in an even layer, over the dough. Now, repeat with the second “batch” of “pastry dough”. Roll out or pinch any separated, perforated pieces together and lay the dough over top of the cream cheese mixture. In a liquid measuring cup, melt the butter in the microwave. In a bowl, mix the sugar, cinnamon and cayenne pepper. No it’s not spicy at all. I PROMISE your kids will still eat them. You will be glad you added it! You’re welcome. Pour the melted butter over the top of the dough and sprinkle with the sugar-cinnamon-cayenne pepper mixture. Drizzle honey over top. Pop in the oven and bake for about 30 minutes or the edges are golden brown. If the top is not caramelized as good as you want it, broil for a minute or so. WATCH CAREFULLY! Oh goodness…please, for the love of God, watch carefully. I’m scared now. It will scorch very fast, get VERY HOT and will continue caramelizing for about a minute after you pull it out of the oven. Cool completely. 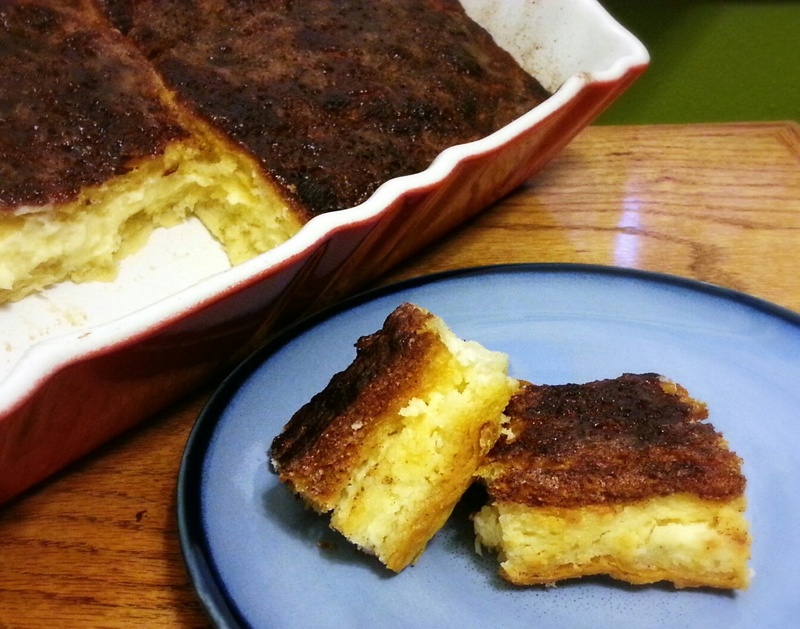 As soon as you are comfortable enough with yourself and you gather enough self control to put these Mexican Cheesecake Bars or soapapillas in your refrigerator, do so. And leave them there to chill for at least 3 hours. Forget about them. Please. Or you WILL eat them all uncontrollably. I know this from experience. Plus they cut better cold. **You may just want to go ahead and double the recipe. This entry was posted in Breakfast/Brunch, Holiday cooking, Recipes, Sweet Tooth and tagged cheesecake, cheesecake bars, cream cheese, Mexican cheesecake, soapapilla. Bookmark the permalink.